I got this SMS spam over the weekend. I consider this as SMS SPAM because I did not subscribe to anything related to MANILA BANKERS. As part of our THANKSGIVING PROGRAM, you are entitled to receive EXCLUSIVE REWARDS and PRIVILEGES from MANILA BANKERS. from 9am-5pm only and look for Ms. Grace Laza for assistance. Thank you and God Bless. 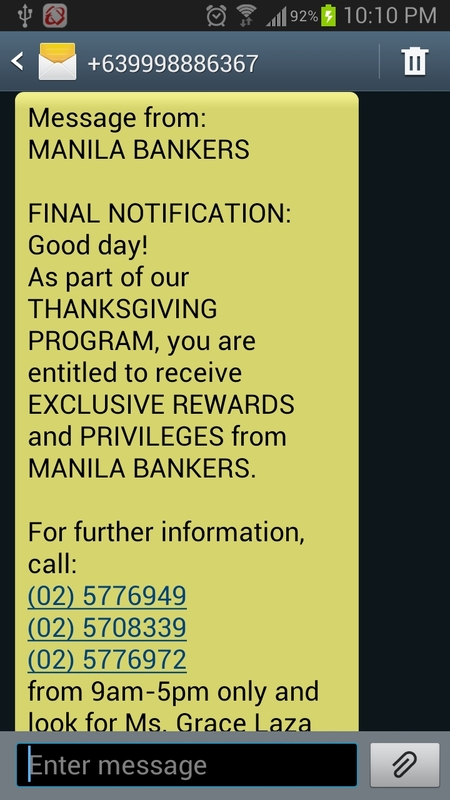 The text message have the classic “enticing reward” bait but sorry MANILA BANKERS spammer, it was a epic fail sms spam. Try it again so that I may consider upgrading your classification to sms scam. It is interesting to note that with my previous mobile service provider, I got tons of these sms spam and scam but with my new mobile service provider this was the first SMS spam in about six months of subscription.